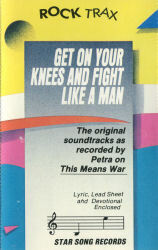 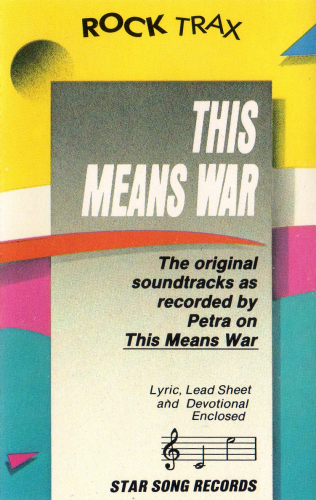 Petraspective - Petra Discography: Accompaniment Trax - PETRA - THIS MEANS WAR! 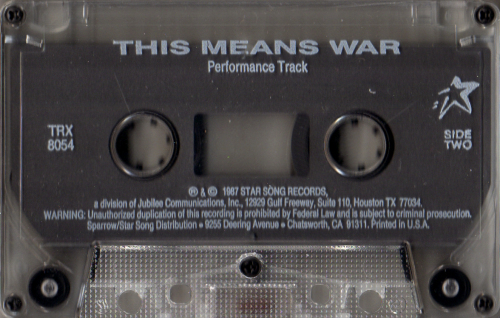 STAR SONG ROCK TRAX: THIS MEANS WAR! 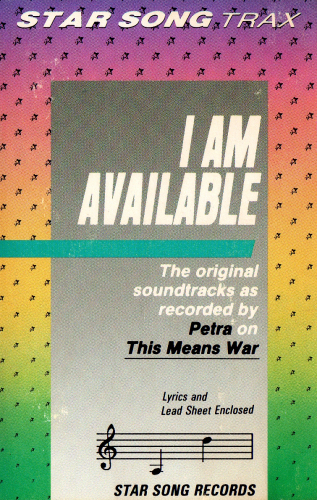 The original soundtracks as recorded by PETRA on THIS MEANS WAR! 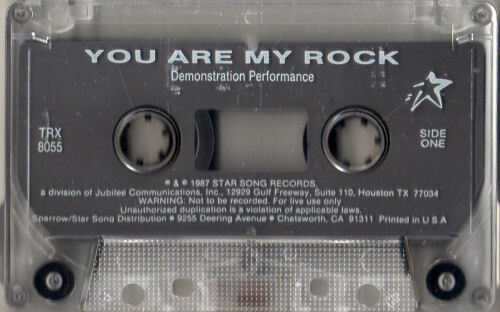 © & (p) 1987 Star Song Records, a division of Jubilee Communications, Inc., 12929 Gulf Freeway, Suite 110, Houston, TX 77034 | Sparrow/Star Song Distribution, 9255 Deering Ave., Chatsworth, CA 91311 | Printed in U.S.A.
STAR SONG ROCK TRAX: YOU ARE MY ROCK The original soundtracks as recorded by PETRA on THIS MEANS WAR! 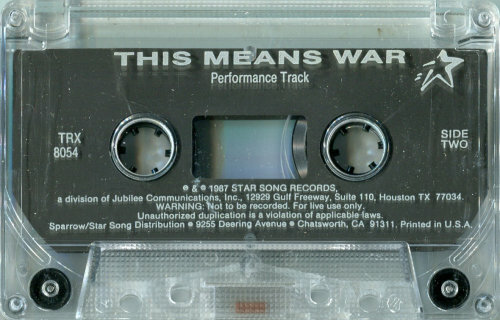 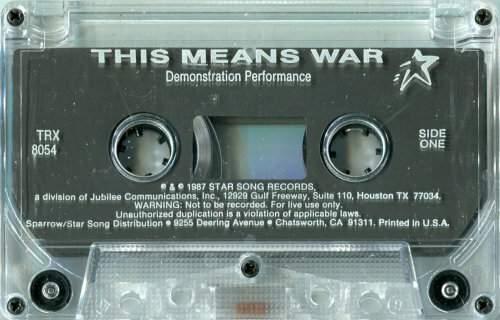 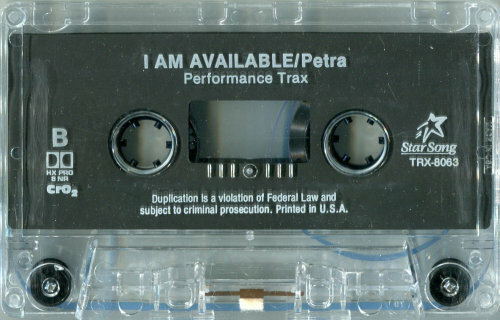 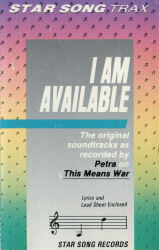 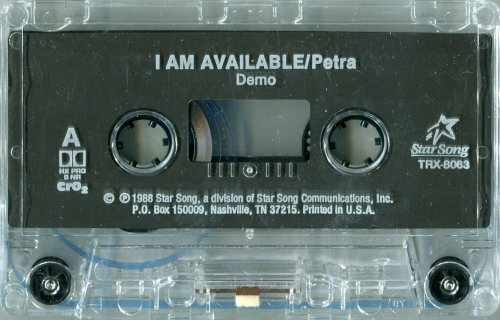 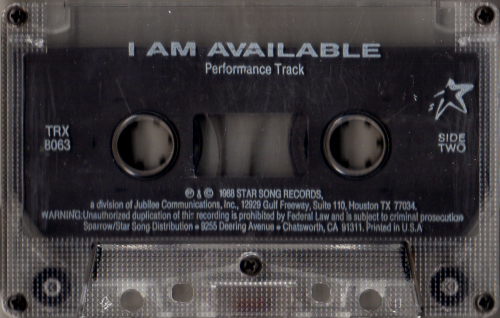 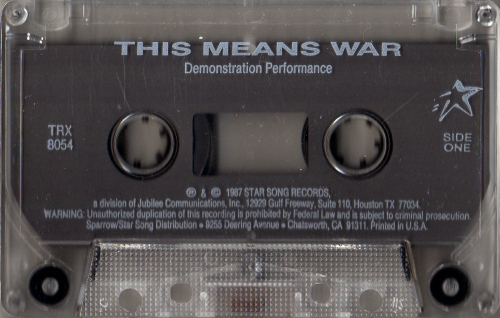 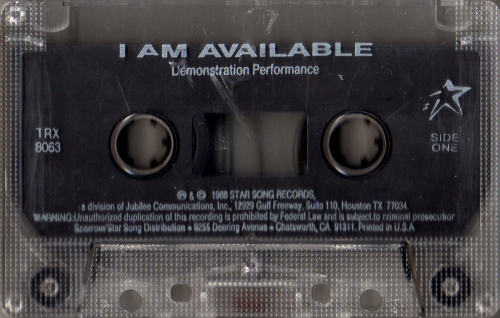 STAR SONG TRAX: I AM AVAILABLE The original soundtracks as recorded by PETRA on THIS MEANS WAR! 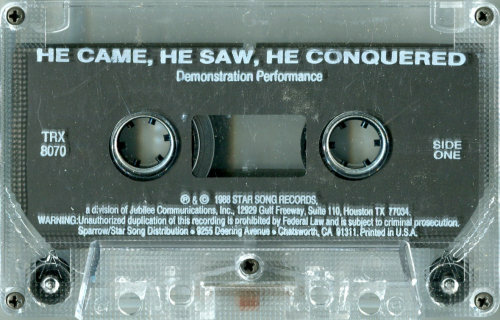 © & (p) 1988 Star Song Records, a division of Jubilee Communications, Inc., 12929 Gulf Freeway, Suite 110, Houston, TX 77034, (713) 484-5505 | Sparrow/Star Song Distribution, 9255 Deering Ave., Chatsworth, CA 91311 | Printed in the U.S.A. 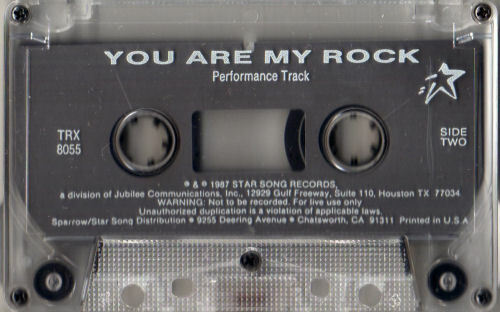 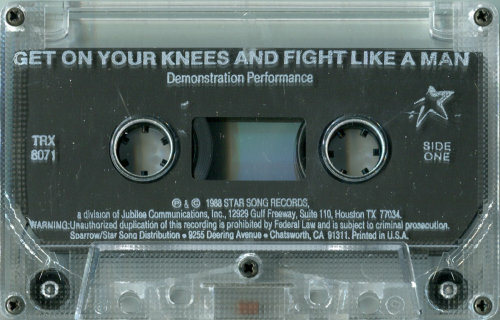 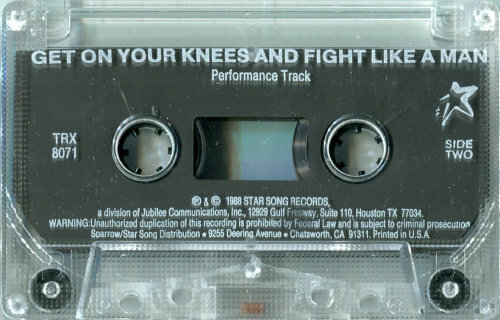 Shell: © (p) 1988 Star Song, a division of Star Song Communications, Inc., P.O. 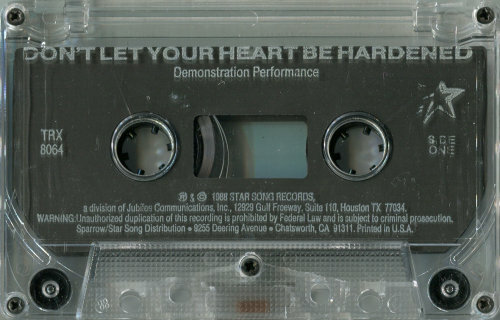 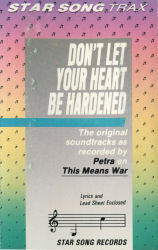 Box 150009, Nashville, TN 37215 | Printed in U.S.A.
STAR SONG TRAX: DON'T LET YOUR HEART BE HARDENED The original soundtracks as recorded by PETRA on THIS MEANS WAR! 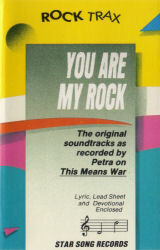 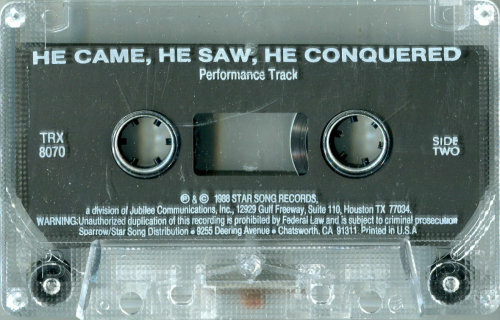 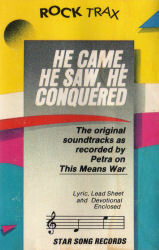 STAR SONG ROCK TRAX: HE CAME, HE SAW, HE CONQUERED The original soundtracks as recorded by PETRA on THIS MEANS WAR! 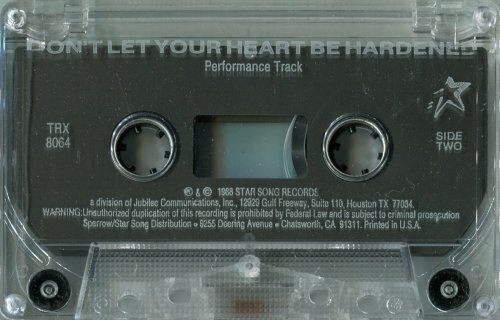 © & (p) 1988 Star Song Records, a division of Jubilee Communications, Inc., 12929 Gulf Freeway, Suite 110, Houston, TX 77034 | Sparrow/Star Song Distribution, 9255 Deering Ave., Chatsworth, CA 91311 | Printed in U.S.A.
STAR SONG ROCK TRAX: GET ON YOUR KNEES AND FIGHT LIKE A MAN The original soundtracks as recorded by PETRA on THIS MEANS WAR! 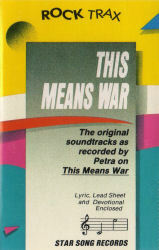 STAR SONG ROCK TRAX: ALL THE KING'S HORSES The original soundtracks as recorded by PETRA on THIS MEANS WAR!